“A Voyage to Abyssinia” — A GOOD, Lively, & Readable Account (ABYSSINIA). Salt, Henry. 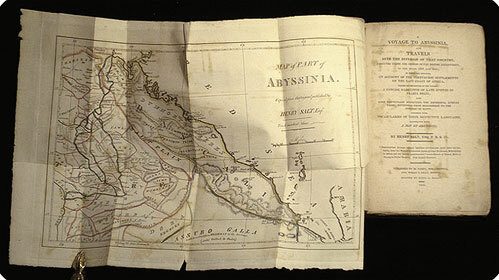 A voyage to Abyssinia, and travels into the interior of that country, executed under the orders of the British government, in the years 1809 and 1810; in which are included, an account of the Portuguese settlements on the east coast of Africa .... Philadelphia: M. Carey; Boston: Wells & Lilly (pr. by Lydia R. Bailey), 1816. 8vo (23.5 cm, 9.25"). 24, 454 pp. ; fold. map., illus. FIRST BIBLIOGRAPHY of AMERICANA (+) León Pinelo, Antonio de. Epítome de la bibliotheca oriental, y occidental, nautica, y geográfica ... Añadido y enmendado nuevamente en que se contienen los escritores de las Indias orientales, y occidentales, y reinos convecinos China, Tartaria, Japón, Persia, Armenia, Etiopia y otras partes. Madrid: En la oficina de Francisco Martinez Abad, 1737–38. Folio (30 cm; 11.75"). 3 vols. I: , ,  ff. II:  ff. III: 202 pp. (Again??) Back to Africa?! United States. Congress. [drop-title] Report on colonizing the free people of colour of the United States. February 11, 1817. Read, and committed to a committee of the whole House on Monday next. [Washington: William A. Davis, 1817]. 8vo. 5 pp.  An early document of the American Colonization Society, founded in December 1816. Concerns the feasibility of negotiating with Great Britain to establish a colony of free blacks in Sierra Leone. Government document: House document (United States. Congress. House); 14th Congress, 2nd session, no. 78. Printed at head of title: . Van Buren, Martin (President, 18371841). [drop-title] Search or seizure of American vessels on coast of Africa, &c. Message from the President of the United States, transmitting a report from the Secretary of State, in relation to seizures or search of American vessels, &c. March 3, 1841. Read, and laid upon the table. [Washington, 1841]. 8vo. 766 pp.  The ships were being stopped as part of England's attempts to end the slave trade. Correspondence between the Secretary of State and the Legation of the United States in London, the British Legation at Washington, and the United States Consulate at Havana. Correspondence dates from 12 February 1836 to 1 March 1841. Government document: 26th Congress, 2d Session. Doc. No. 115. Ho. of Reps. Executive. keywords, e.g. = AFRICA, AFRIQUE . . .